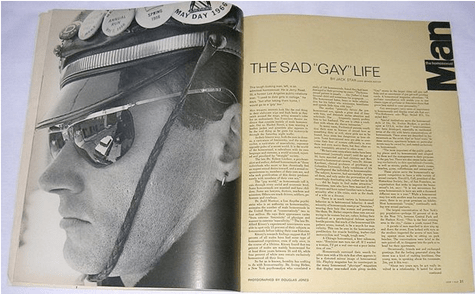 B2S.com Gay History - January 10, 1967: LOOK Magazine Publishes Story On "The Sad Gay Life of the Homosexual." LOOK was an American bi-weekly, general-interest oversize magazine published 1937 to 1971. Generally considered a rip-off of Life magazine, which began publication months earlier and ended in 1972. LOOK’s circulation was about 2.9 million copies per issue and is known for helping launch the career of film director Stanley Kubrick, who was a staff photographer. 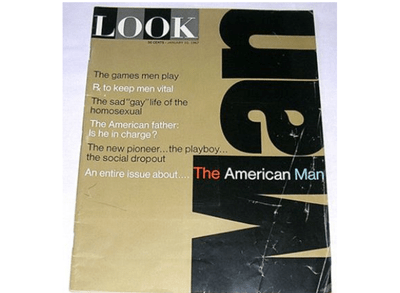 In the January 10th, 1967 issue of LOOK the entire issue is about… the American Man, and we learn about “the sad ‘gay’ life of the homosexual. While the complete contents of the article are not available for republishing here. In the end the article comes to the brilliant solution that the real reason men are gay is because of women (specifically overbearing mothers). The article has also been referenced and used as talking points by many anti-gay groups in the past. Hardly ten years later, the Look Magazine article was fast becoming obsolete. In 1977 after the Des Moines publisher perpetuated the stereotypes about gays, Anita Bryant brought her anti gay crusade to Des Moines. She was met with a pie in the face. It was one of the messages that gays were coming out and not going to accept being treated as second class citizens anymore. if my mother made me gay, thanx mom! best thing that ever happened to me!